Interactions of cationic tetrakis (N,N´,N´´,N´´´-tetramethyltetra-3,4-pyridinoporphyrazinatocobalt(II) (Co(tmtppa)) with synthetic polynucleotides, poly(A-T), poly(G-C) and calf thymus DNA have been characterized in 5 mM phosphate buffer, pH 7.2, by optical absorption and fluorescence spectroscopy. The appearance of hypochromicity effect and the red shift in UV-Vis spectrum of porphyrazine was due to the interaction of both poly(A-T) and poly(G-C) which is similar to interaction of porphyrazine with DNA. 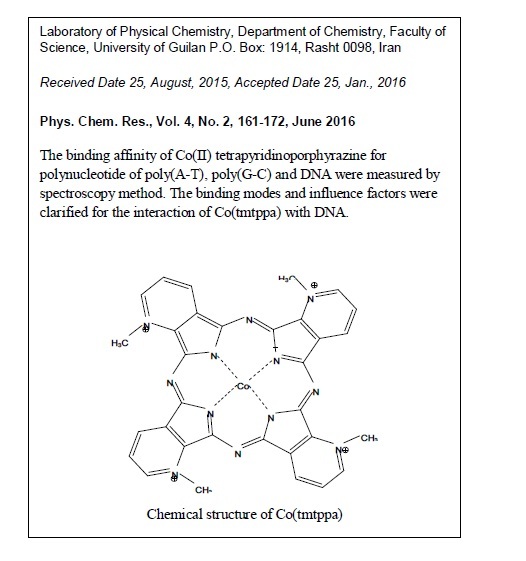 The binding constants (K) were determined from the changes in the optical absorption spectra at various poly(G-C), poly(A-T) and DNA concentrations. According to the results, the values of K were 2.50 × 106 M-1, 2.25 × 106 M-1 and 2.25 × 105 M-1 for poly(A-T), poly(G-C) and DNA, respectively, at 25 ºC. The thermodynamic parameters were calculated by the van’t Hoff equation. The positive values of the entropy and enthalpy suggest that coulombic interactions may play an important role in stabilization of the complex formed. The influence of the ionic strength was also investigated. It was concluded that the apparent binding constants decrease with increasing salt concentration. The fluorescence quenching of the DNA-ethidium bromide complex by the porphyrazine was also investigated. The values of the quenching constant (KSV) was determined by the Stern-Volmer equation. The results revealed groove binding mode of porphyrazine for both A-T and G-C rich region of polynucleotides of DNA.